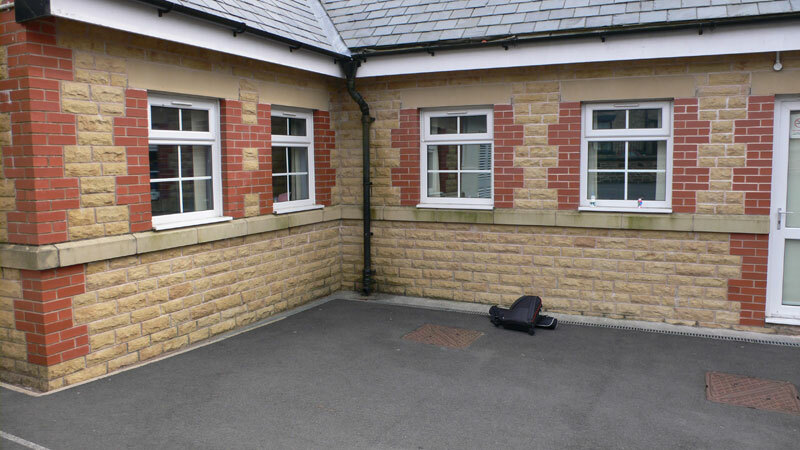 Turton Belmont Community Primary School in Lancashire. The school playground was in need of a complete upgrade, and the primary school's PTA funded the Outdoor Seating for the school, opting for a 'value for money' long life product in Recycled Plastic. 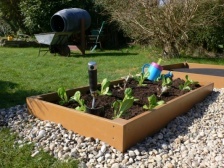 Gareth Lane, Deputy Head Teacher said, "We love the idea of using recycled plastic for our outdoor seating because we are a very eco-friendly school, always going for the next eco-award opportunity, and this seemed the most sensible and plausible option to choose". The whole life cost was much less than a wooden equivalent, a fact confirmed by cost comparison studies carried out by WRAP (Waste Resources Action Programme), an independent body supported by all 4 UK governments to promote recycling. Wood soon looses its attractive new appearance, and generally needs maintenance after just 2 years and complete replacement after 7 years. 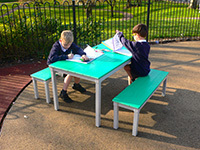 This Recycled Plastic Outdoor Seating for schools is part of the Ribble Rainbow Range of Outdoor Classroom furniture supplied by Kedel Limited. It will never need any toxic preservatives or paint and can be expected to last in the region of 40-50 years without any maintenance. Mrs Maxine Le Good, Chairman of the Belmont Community Primary School's PTA who funded the refurbishment, came to look at the new installation on the first day back after the Easter Holiday break. "We chose recycled plastic outdoor seating for the school because it's very durable, doesn't rot, and its bright green colour is UV protected. It will still look great even in a few years, so no more run down look or maintenance costs. And look how delighted the children are," she said, "they think it's Christmas." Turton Belmont Community Primary is a member of the Eco-Schools group and the teacher responsible for the Eco-School's programme, Emma Seed, was delighted to be getting recycled plastic outdoor seating, as it serves as a great example of what happens to all the waste plastic being recycled by the children and their families. "It will help the children understand how useful our recycled plastic waste can be," she says, "and provides concrete evidence of our school's eco-friendly ethos." The growth of Recycled Plastic Outdoor Chairs in UK schools and colleges is driven by demand for a maintenance free product, as well as the desire to inspire an eco friendly approach that protects the environment. Like Turton Belmont Community Primary, many schools are aiming to gain the Green Flag award, an international award programme, that guides schools on their sustainable journey. It aims to provide a framework and foster the growth of green principles in the ethos of every school. 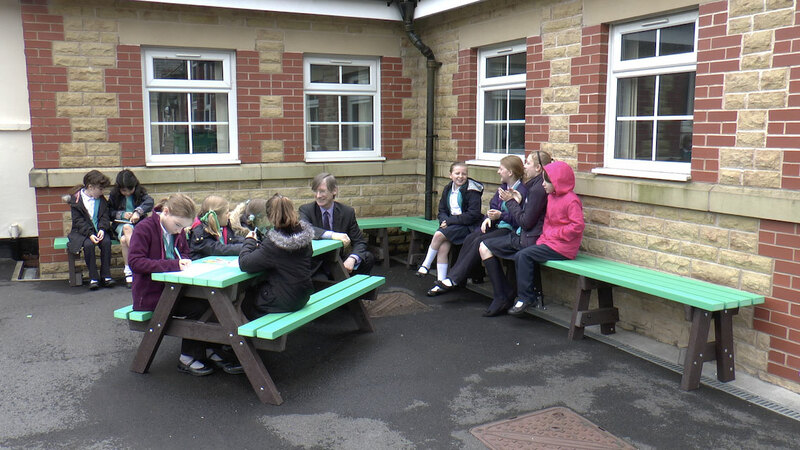 Installing this eco-friendly outdoor seating at Turton Belmont Community Primary School is an excellent example of how every school can both encourage green principles, while at the same time investing in a long term value product, that can reduce the school's annual maintenance and replacement costs by up to 80%. 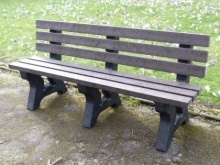 A beautiful 3 Seater Garden Bench made from British Recycled Plastic. Fully assembled. Manufactured from recycled CD cases and old coat hangers. Does not warp, crack or splinter and no surface splinters for little fingers. The UV protected colours are embedded in the plastic during manufacture, so no need for painting. 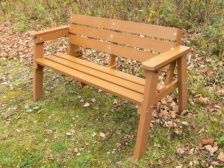 A unique maintenance free garden or recreational area bench. 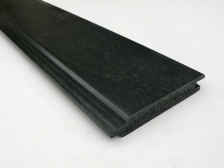 These Synthetic Wood Tongue and Groove 100x18mm boards come in various colours such black, light oak, mahogany, cedar, white, pebble grey and anthracite grey. And have the highest level of UV protection. Great for gates and gate inserts. How to Work with Kedel's Plastic WoodWorking with Recycled Mixed Plastic ProfilesIs recycled plastic more expensive?